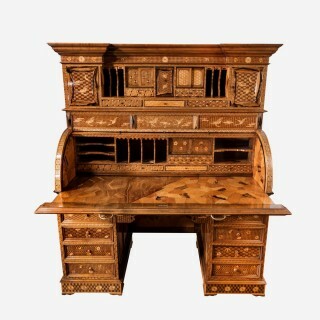 The lowest section with four drawers on either side of the kneehole and side cupboards, the central section with the roll top opening to reveal a pull out writing slide, pigeon holes, small shelves and drawers, the upper section with an elaborate arrangement of further drawers, cupboards and pigeonholes, profusely decorated overall in a variety of exotic woods with stylised birds, butterflies and flowers all scattered over geometric grounds. 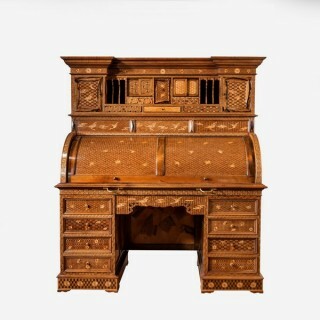 This desk was evidently created to showcase the extraordinary skills of the Japanese craftsmen to the European market. 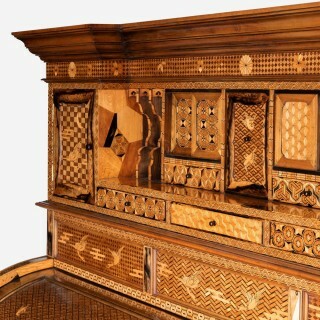 Unusually the parquetry also covers the reverse of the desk so it can be free standing. 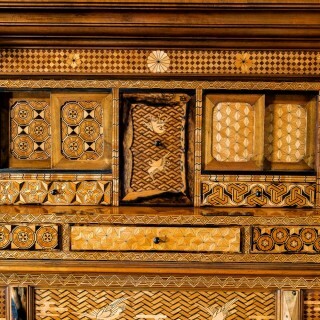 The detail and quality in th execution of the inlays is superb, especially the way the cabinet maker has even inlaid the knobs to correspond with the inlays I the main piece. 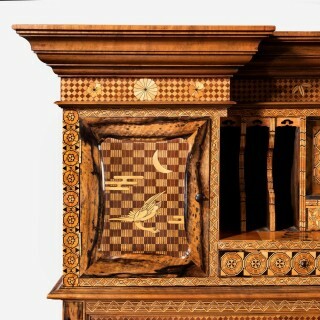 Just amazing skill.